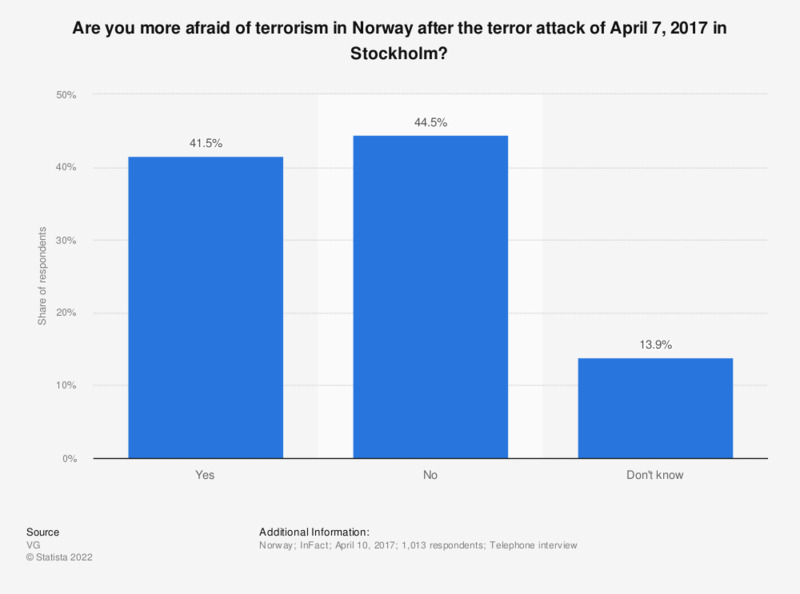 This statistic shows the results of a survey on the grown fear of terrorism in Norway after the terror attack of April 7, 2017 in Stockholm, Sweden. The results of the survey show that the terror attack in the capital of the neighboring country Sweden led to uncertainty in the Norwegian population concerning the national security. The terror assassination in Stockholm splits Norway and the Norwegians in two when it comes to its influence on the feeling of safety and the fear of similar attacks in their country. 44.5 percent of the responding Norwegians stated that this attack did not create a bigger fear of terror attacks in their home country. 41.5 percent of the respondents stated to be more afraid of acts of terrorism in Norway after the happening in their neighboring country. Still, 13.9 percent are uncertain and stated to not know whether it does influence their fear of terrorism in Norway or not. Percentage points falling below 100 percent are probably due to rounding.